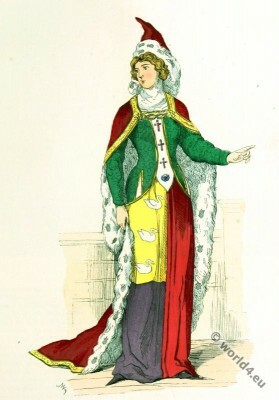 Noble Lady (1364 Charles V). Dame Noble (1364, Charles V). Fashion of the Middle Ages from 1037 to 1461. This entry was posted in 1360, 14th Century, Burgundian dress, France, Middle Ages, Nobility and tagged Burgundian fashion period, Costumes civils et militaires des Français, Gothic costumes on 2/19/15 by world4.